With its combination of sophisticated citylife in Seattle and Portland, and the scenic wilderness of the Olympic Peninsula, this road trip satisfies all ages. For families that want the flair of cities combined with the best that nature has to offer, a road trip through the Pacific Northwest is the perfect fit. Along the main road of Interstate 5 travelers can find the major metropolises of Portland and Seattle to satisfy those big-city needs. And, by traveling off the main road, the majestic mountains, stunning countryside and other smaller localities with fun attractions are sure to dazzle. Finally, the best way to end a western road trip is with the serene beauty of nature at Olympic National Park — also home to Forks, that very important town from the “Twilight” book series. So pack your bags, family, and load up the car with fun games and snacks, because this trip through the roadways, cities and parks of the Pacific Northwest is sure to make even the moodiest children happy in the backseat. Although most road trips are supposed to start with the family actually hitting the road, there is no way that one can come to Portland, Oregon and not spend a day in the hippest city in the Pacific Northwest. There is so much to do and see, and since your family will be spending a large majority of the next few days in a car, why not start with a Portland Walking Tour to explore the neighborhoods of Nob Hill and the Pearl District. Sports fans will love the Oregon Sports Hall of Fame & Museum which exhibits Terry Baker’s Heisman Trophy and other awards as well as several interactive sports challenges. Other fun attractions for the family include the Oregon Zoo, with more than 2,000 animals, and the World Forestry Center, where trees are planted and preserved while visitors learn about their environmental importance. From March to December, Portland has a great Saturday-Sunday Market; if you start your trip on a weekend, head here for handmade crafts, jewelry and gifts, live music, good food and the opportunity to stock your car with tasty treats before you hit the road. Spending a night in Portland is optional. 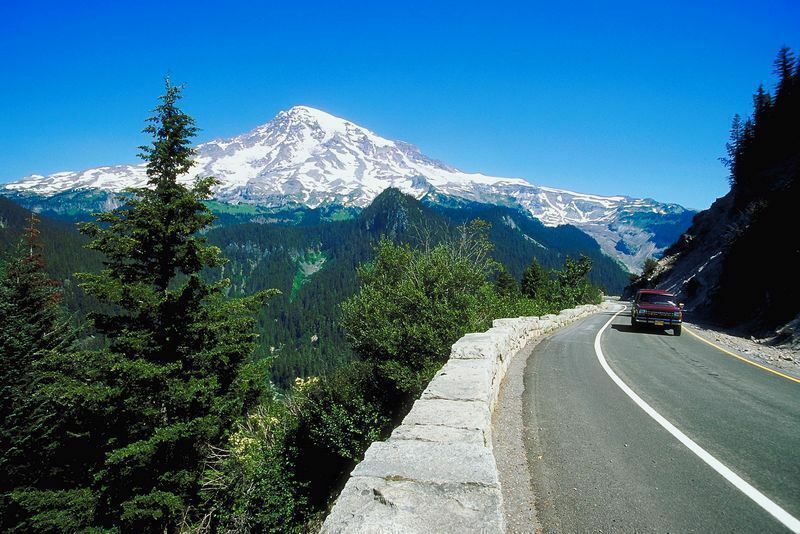 If you hit the road early enough in the late afternoon, it’s about 60 miles east along US-26 to the dense Mount Hood National Forest, which covers more than 60 miles of lush wooded lands. Here families can opt for a more rustic room and board by spending the night at the amazing Timberline Lodge, built from local trees and decorated with carved timbers. The hotel was constructed between 1936 and 1938 during the Great Depression, as a WPA project. Here guests are introduced to an authentic Pacific Northwestern experience filled with charm and warm hospitality. If you have snowboarders in the family, you may already know that the high-altitude Mt. Hood ski area is open all summer long for the country’s top snowboarding academy, and many families use the Timberline as their base if kids are enrolled in the week-long half pipe and freestyle clinics. After a cozy night’s sleep, head north along US-35 through the northeastern portion of the Mount Hood National Forest. 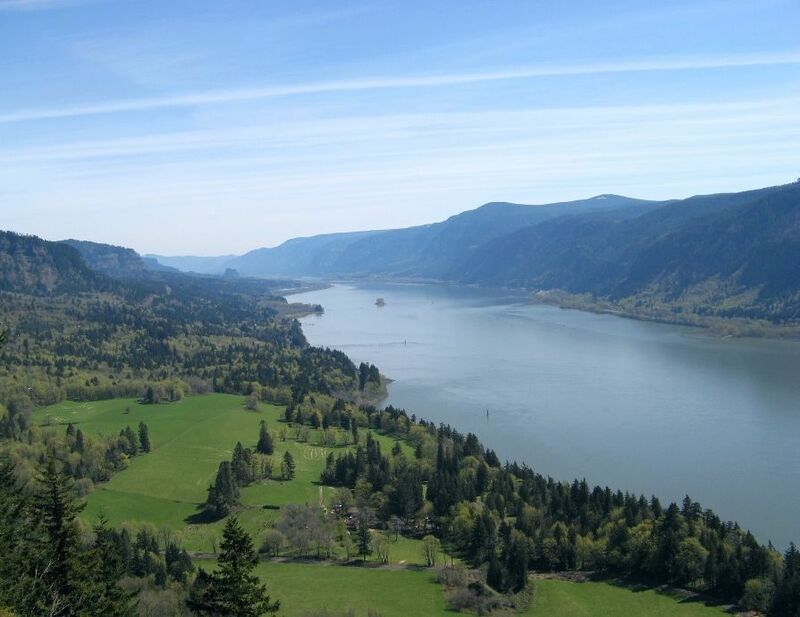 After nearly 40 miles, your family will hit the scenic views of the Hood River. Then continue your trip driving west for 15 miles on I-84 until you hit the Columbia River Gorge Scenic Area. Grab some lunch and stretch your legs while enjoying the scenic views into the river’s steep canyon walls and across the river to the state of Washington. They create a natural wind tunnel which makes the region ideal for various types of wind sports, such as kite boarding, windsurfing and even sailing. Plus, this region boasts the highest concentration of waterfalls in the Pacific Northwest with 75 on the Oregon side alone. Next it’s onward to the majestic Mount St. Helens National Volcanic Monument. Although as the crow flies it’s only about 60 miles away from the Columbia River Gorge, a family would need to be brave to drive the not so reliable roads of backcountry. Thus, we recommend the way back towards Portland along I-84 for almost 35 miles. You will not be re-entering the city, however; instead, drive around it north along I-205 for 15 miles until you join with I-5 near Salmon Creek, Washington. Continue on I-5 for a little more than 40 miles and then head east for another 40-plus miles along WA-504. Once here, luxuriate in the breathtaking views of the active volcano famous for its devastating eruption during 1980. The monument is now open and allows for the volcano and the aftermath of the eruption to be studied and examined for scientific purposes. Depending on the weather and the season, there are opportunities to hike and climb the volcano soaring more than 8,000 feet into the air, and guided talks are given near the Visitor Center. Check the website for details. After experiencing the volcanic splendor of Mount St. Helens the next stop is Chehalis, Washington. The ride will take you west along WA-504 and then north once again along I-5 for 25 miles. Once you’re out of the car, convince the kids to travel back in time and experience life on an old-fashioned train at the Chehalis-Centralia Railroad. A restored logging steam train from 1916 that still operates on nine miles of local track, the trip on the rails is relaxing and allows families to experience life the way it once was in the Pacific Northwest. If you want to check out some more local history visit the Lewis County Historical Museum, which, with a special kids play area, focuses on the history of the region with everything from its strong Native American presence to logging culture and sporting events. The last stop during your day is Chehalis, which will certainly please the motor lovers in your clan. Head to the Vintage Motorcycle Museum where families can see antique Harleys, Indians and other authentic and famous motorcycles brands like they have never seen them before. The majority of the bikes in this collection are from the early 1900s. Also on hand is a bicycle from the early 1800s, the first of its kind ever produced in the Americas. 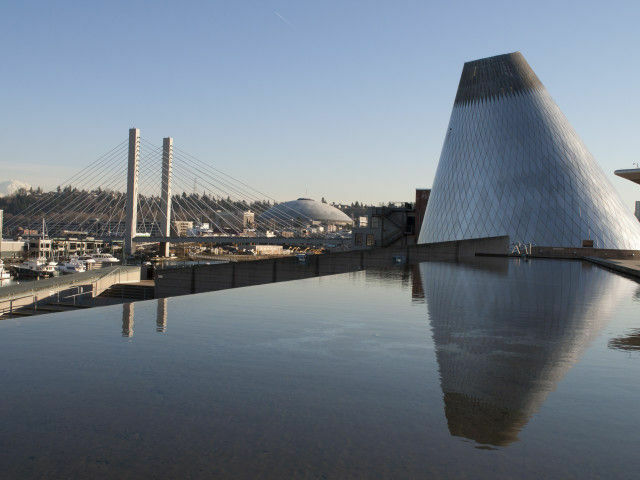 Rejoin the modern times and head further north on I- 5 to Tacoma — another short trip and you are in for a treat. First, anyone that has a fascination with the art of glass blowing has come to the right place as this city is home to both the Museum of Glass and an actual glass bridge that pedestrians can walk across to get to the downtown part of the city. Kids will love that this museum offers opportunities for them to safely create their own glass objects. Other fun indoor options include the Children’s Museum of Tacoma and the Washington State History Museum. But if these options sound stuffy, there is plenty to do outdoors. Tacoma is a city on the water, right off Commencement Bay, so the Foss Waterway Seaport, a maritime museum housed in an authentic century–old Balfour Dock building, is a great way to spend the afternoon. Or head just out of Tacoma to the Wild Waves Themepark, both an amusement and water park combined, to provide thrills for the whole gang. Favorite kid rides include Speed Racer and the Tree Topper. We have reached the mid-way point of our Pacific Northwest road trip and are in the Emerald City, Seattle, Washington. It is only 40 miles north of Tacoma along I-5, but beware of the big city traffic which might delay your journey a bit. Of course, everyone in the car, young and old alike wants to see the iconic Space Needle. With an observation deck that is 520 feet in the air, the building offers one of the best views of the city and Lake Washington. Families looking to splurge can get an even cooler panoramic view with a Seattle Helicopter Tour. Back on the ground, head to the Pacific Science Center where kids can participate in fun, educational and interactive exhibits and programs. Plus, the center even does laser shows! Also fun for visitors is the Children’s Museum, Seattle and for families interested in catching a play designed with the young in mind, buy tickets to a performance at the Seattle Children’s Theater. Next stop is to the ultimate Pacific Northwest locale: the Olympic Peninsula. From Seattle, head north on I-5 for a few miles until you see signs for WA-104 toward Edmonds. Stay on this smaller, state road for 25 miles until you see signs for WA-101/N, the Olympic Highway. 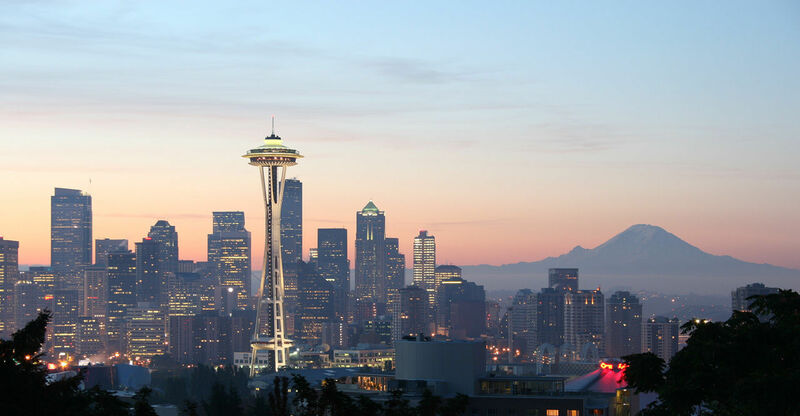 Another fun option for families to consider: Seattle, and all of Washington State for that matter, is serviced by many ferry routes which can connect you to either 104, 101 or other nearby roadways. Visit the official Washington State Ferries website for information and schedules and figure out if any of the routes can be worked into your itinerary. It’s a nice break to get the kids out of the car and out in the open for some fresh salt air as your continue on your way. Surrounded by untouched coastline and carved by over 60 glaciers, this region evokes the natural wonders of ancient rainforests, opaque woods, sub-alpine meadows, rugged ocean beaches, unspoiled lakes, rushing rivers, and bubbling hot springs. And in the center of this splendid paradise are the snow-capped peaks of the Olympic Mountains which rich, native cultures have inhabited for thousands of years. The region ambles along old-growth giant forests of fir, hemlock and cedar, carpeted with bead-lilies, sandy beaches, fields of wildflowers and bubbling springs. Set in the center of the North Olympic Peninsula, the Sequim and Dungeness Valley is the gateway to Olympic National Park. The waters of Sequim Bay are perfect for active families who wish to sail, bird watch or kayak out to the historic Dungeness Lighthouse. Make sure to visit the Dungeness National Wildlife Refuge, a magnet for marine life and waterfowl. Outdoor recreational possibilities for family fun are endless in the Sol Duc Valley region of the park where the popular hot springs (temperatures range from 90°F to 105°F) allow for a soothing soak in any of the three mineral pools. Lake Crescent is a 12-mile-long, glacially-carved clear lake that plunges more than 600 feet at its deepest. This picturesque lake offers swimming, boating, and fishing along with several diverse hiking trails. Nearby is the Hoh Rain Forest, one of the only temperate-zone rainforests in the world and visitors can find several campgrounds, hiking trails, and interpretive exhibits. Don’t miss the popular Spruce Nature Trail through impressive strands of old-growth Sitka spruce, with interpretive plaques explaining the ecology of the rainforest along the say. Note that all of these different sections of the park are within driving distance, but they should be mapped out appropriately. There are plenty of cozy and relaxing bed and breakfast options in the area, and the towns of Port Angeles and Forks offer other accommodation options. However, if your family is truly the outdoors-type, consider camping in the park and venturing out to explore each day. No matter what your lodging choice, the area is a fantastic way to end your Pacific Northwest road trip adventure. Your description of the trip from Seattle to The Olympic Peninsula is very misleading. You make it sound like you can just drive 25 miles from WA 104 exit on I-5 to WA 101. " From Seattle, head north on I-5 for a few miles until you see signs for WA-104 toward Edmonds. Stay on this smaller, state road for 25 miles until you see signs for WA-101/N, the Olympic Highway." At Edmonds you have to board a Washington State Ferry to Kingston before you can continue on WA 104 and reach WA 101N to Port Angeles. During the summer months there is often a wait of anywhere from 1-3hrs for the ferry, which then takes about 40 minutes to cross Puget Sound. Add to that the times for loading and unloading and you could be looking at several hours. The waits are usually much shorter in the off season except on holidays such as Thanksgiving or Christmas and long weekends. Also Port Angeles is not the setting for the "Twilight Saga". You need to travel for approximately another hour and a quarter, about 60 miles, west, past Lake Crescent and south, to Forks where the main characters lived and attended Forks High School. Oh, and the Hoh Rain Forest is over an hour drive south of Forks on WA 101 then about 19 miles up a small Park road to the Visitor Center and trails. Thanks for your corrections Tom. It is confusing that the author mentions the ferry but doesn't explain how long the wait can be or how big a trip this is. YOur notes are really helpful in planning a road trip. But I have to take issue with you on the "Twilight" books. According to the state's own tourism department "As every fan of the Twilight books (and movies based on them) knows, the story is set in and around Forks, La Push, and Port Angeles. All of these Olympic Peninsula towns are easily accessible from US 101, the scenic highway that loops around Olympic National Park." Although most of the films have been shot around Portland, Oregon, the state is still proud that they were originally written for Washington, and in fact have been big tourism draws for many visitors. Look forward to seeing it myself!